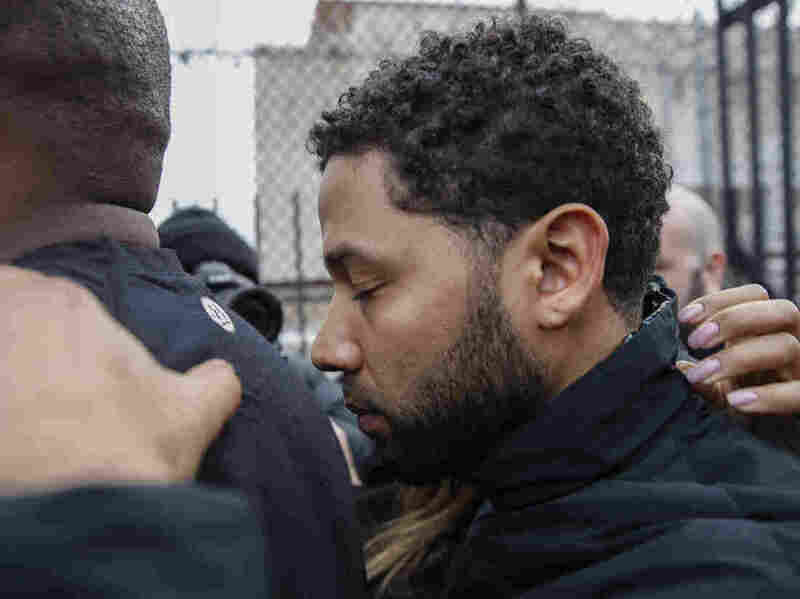 Jussie Smollett 'Took Advantage Of The Pain And Anger Of Racism,' Police Say The Empire actor has been released on bail after being arrested on charges of making a false police report. Officials say he paid two men to fake an attack on him to "further his own public profile." Jussie Smollett leaves the Cook County Jail following his release Thursday in Chicago. 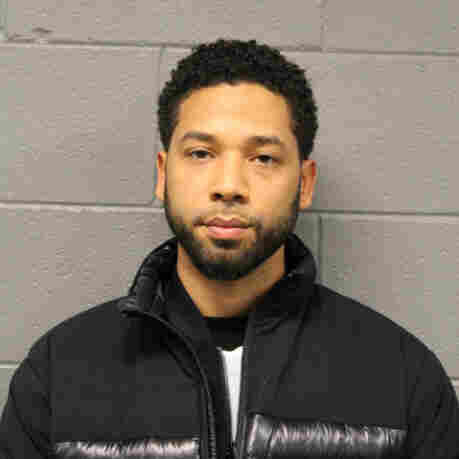 Smollett was charged with filling a false police report after he said he was attacked by two men who shouted racist and anti-gay slurs. Weeks after Jussie Smollett reported being assaulted in a potential hate crime, the Empire actor has been released on bail after police questioned him for allegedly orchestrating the attack. Chicago Police Superintendent Eddie Johnson said Smollett faked the incident, paying two brothers about $3,500 to join a "publicity stunt" staged by Smollett because he "was dissatisfied with his salary." "Jussie Smollett took advantage of the pain and anger of racism to promote his career," Johnson said at a news conference Thursday after Smollett's arrest. "I'm left hanging my head and asking why," he continued. "Why would anyone, especially an African-American man, use the symbolism of a noose to make false accusations? How could someone look at the hatred and suffering associated with that symbol and see an opportunity to manipulate that symbol to further his own public profile? How can an individual who's been embraced by the city of Chicago turn around and slap everyone in this city in the face by making these false claims?" The Cook County State's Attorney's Office has approved disorderly conduct charges against Smollett for allegedly filing a false police report. If convicted of the felony, he could face up to three years in prison. Later Thursday, Smollett appeared in court for a hearing during which his bond was set at $100,000. He has not publicly responded since his arrest, but his lawyer, Jack Prior, vowed Thursday to push back against the allegations. "These are outrageous allegations, but my client vehemently denies all this," the attorney said. "He is not a threat to society, and is not a flight risk. He came back yesterday from out of state, knowing charges were imminent. He surrendered this morning at 5 a.m. and wants nothing more than to clear his name." Less than a day later, the executive producers behind Empire announced that they plan to write Smollett's character off the program for at least the end of its current season. "The events of the past few weeks have been incredibly emotional for all of us. Jussie has been an important member of our EMPIRE family for the past five years and we care about him deeply. While these allegations are very disturbing, we are placing our trust in the legal system as the process plays out," said Lee Daniels, Danny Strong and their fellow producers, many of whom initially expressed their support for Smollett in the days after the reported attack. "We are also aware of the effects of this process on the cast and crew members who work on our show," they added, "and to avoid further disruption on set, we have decided to remove the role of 'Jamal' from the final two episodes of the season." The arrest Thursday represents something of a surreal twist to a story that first surfaced late last month, when Chicago police revealed that Smollett had reported being assaulted in a possible hate crime. The actor and musician, who is black and gay, said two individuals had accosted him with racist and homophobic slurs, beaten him and placed a rope around his neck before fleeing. He also said that he had received a threatening letter using racist and homophobic language a week earlier — though police now say that, too, was falsified in an attempt "to gain attention." "When that didn't work," Johnson explained, "Smollett paid $3,500 to stage this attack and drag Chicago's reputation through the mud." Detective Cmdr. Edward Wodnicki laid out an exhaustive timeline of how police arrived at this conclusion, saying they relied on security footage and tips from the community to identify the two brothers Smollett allegedly enlisted. They had flown to Nigeria shortly after the incident, but authorities were at Chicago O'Hare International Airport waiting to detain them when they returned to the country on Feb. 13. Johnson said it wasn't until the very end of their interrogation that the brothers decided to confess. "It wasn't until the 47th hour of their 48-hour hold time — that we could legally hold them in custody — that it took a change," Johnson said, adding that it was at that point that the brothers implicated Smollett. "The brothers agreed to cooperate in the investigation," Risa Lanier, a prosecutor with the Cook County State's Attorney's Office, explained during the bond hearing later. "As more evidence — such as text messages, phone records, social media records, bank records, surveillance video and the receipt from the purchase of the rope — was obtained by investigators, this investigation shifted from a hate crime to disorderly conduct." Johnson put it more bluntly. "When we discovered the actual motive, quite frankly, it pissed everybody off — you know, because we have to invest valuable resources." And he expressed frustration not only at Smollett's conduct but also at the amount of media attention it has received. Johnson said he is also "concerned" about what Smollett's alleged actions mean for future victims of hate crimes. "My concern," he said, "is that hate crimes will now publicly be met with a level of skepticism that previously didn't happen." According to statistics recently published by the FBI, there was a 17 percent jump in hate crimes from 2016 to 2017. In a separate study, the Human Rights Campaign reported that last year, 67 percent of 12,000 black LGBTQ youth they surveyed had been verbally insulted because of their identity; 30 percent of those surveyed said they had been physically threatened. "Our laws exist to reflect and defend [our shared] values, and hate crimes will never be tolerated," Chicago Mayor Rahm Emanuel said in a statement released Thursday. "A single individual who put their perceived self-interest ahead of these shared principles will never trump Chicago's collective spirit."